From bold and assertive navy to serene duck egg, OPI has a range of blue hues to suit your every mood and outfit of the season. 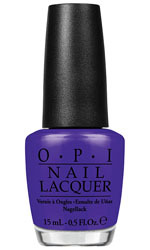 OPI best sellers include Russian Navy, Blue My Mind and No Room for the Blues nail polish. This baby blue nail polish is a true bundle of joy. Its easy to sea why this shimmering ocean blue is the right colour for you. A must have bright blue aqua creme. A light blue creme, delicious, sweet and icy cool. This indigo blue is as deep as the sea. Who needs one when you are up a creek with this cool and tranquil blue. May break my bones but this deep blue nail polish shade will never hurt me! A continental deep blue cream. As soft as his jeans this indigo inspires true blue devotion, rich in colour with the long lasting wear of a gel manicure. I hope you take credit, because I must have this aqua, rich in colour with the long lasting wear of a gel manicure. 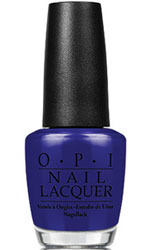 A smart, dusky blue for secret agent fashionistas, rich in colour with the long lasting wear of a gel manicure.